After opening up the base cover under the unit (just one screw needed to be removed, and the the cover rotated to removable position) I did a few quick electrical tests with a DVM (be careful of high voltages!). With the unit powered down and the heater quickly disconnected and out of circuit, I measured its resistance: about 15 ohms, appropriate for a heater of its power rating used at 120V. So, the heater seemed OK and not the cause of the unit not heating up. Next, I decided to look at the main power circuit board that contained the relay described above plus DC power supply for the display panel and some associated control circuitry. The board could be removed by taking out just 2 screws. 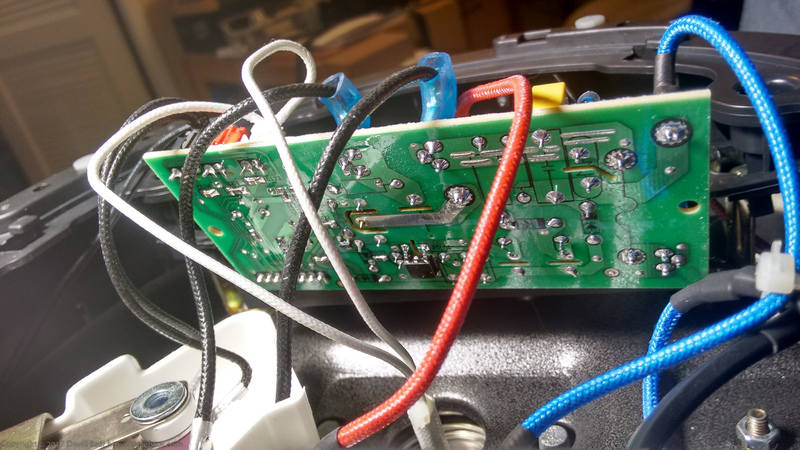 Quick inspection of the underside of the circuit board revealed a highly suspect visible flaw in the solder at the common switch side of the relay. Essentially, there was a dark ring surrounding the relay pin between the pin and the solder on the board. Resistance measurements quickly confirmed no connection between the pin and the board. The suspect area is circled in red in the second photo below. To perform the repair, I cleaned the pin of the relay with fine sandpaper, and then re-soldered it to the board. I left an especially thick cross-section of solder between pin and board, and along the full trace to the heater wire, since this is a high current path. Quick reassembly and testing showed the pressure cooker to be heating and working fine again. One more appliance saved from disposal! Searching Instant Pot repair, found your page. 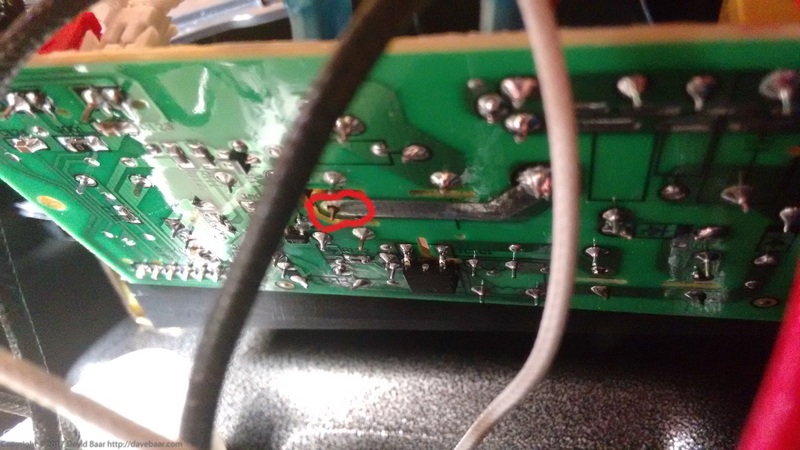 Found the same spot solder looks almost the same with not enough solder surrounding the spot. Clean it and resolder, wife is happy got her pot working again. Can’t thank you enough for saving buying a new one. Thanks for posting this. Our IP, is a little over 3 years old. It worked fine, twice last night, then when my wife added the final ingredients (vegetables) it, then it refused to work. I found the same problem and repaired it the same way. Butch and leho, thanks for your comments. Nice to know these repair write-ups are useful. I’m considering telling the manufacturer, since this problem is clearly happening to a lot of these Instant Pots. Until I saw this I was sure it was the heater. I tested it with my meter like you said and it was fine. I just soldered it a little while ago and it now works. Hey, Dave, you’re welcome and thanks for letting me know. Now that yours is at least the 4th that I know of with this exact same problem, I’m going to inform the manufacturer. I’ll post about that soon. Hi. I do repairs of electronics and appliances as a hobby (to reduce waste, for environmental reasons). Recently, I’ve come across four instances of your Instant Pot products that have failed at exactly the same way at the same point on a PC board inside the units, at a connection to a high current relay. I’ve documented one of the failures, as well as my repair to it, on my repair blog here: http://media.davebaar.com/wordpress/?p=1368. See the photos of the problem especially. Note also the comments from owners of your products below that blog post who have experienced this exact same failure. Are you aware of any similar failures already, and do you have any comments in regard to this matter? Given the frequency of the same specific failure, I think it deserves your attention. It is likely that the problem could be easily solved in your future production by making that connection more capable of carrying high current, possibly via a larger cross-sectional area connection to the relay lead; it seems likely that self-heating at that point is what is causing the failures. I’m happy to report that a support person for the manufacturer quickly got back to me after I sent them the information about the failed solder joint. That person has been diligently working to follow up and collect model number(s) and other information about any failed units. So, if anyone out there knows of Instant Pots that have failed similarly, please post model and serial number info here and I’ll send it on to the manufacturer. I think this reflects well on Instant Pot as a company. Here they have responded quickly to a customer problem, and have followed up diligently afterward to look for the cause. 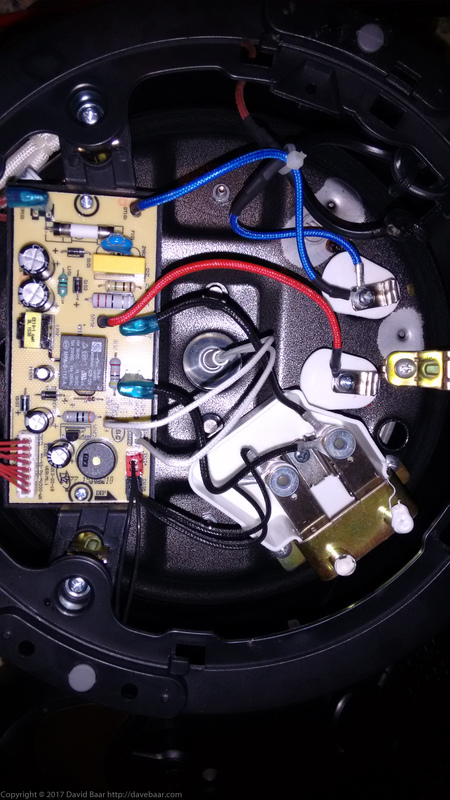 I came across this whilst searching for why my Instant Pot IP-LUX60 stopped getting hot but, whilst my circuit board looks similar from above, the underside is different and may be that’s because they updated it or because the one here is an IP-DUO60. Anyhow, mine was only 2 weeks old and I reported it as faulty and the supplier simply refunded it and didn’t want the old one back. Meanwhile the price has gone back up by 50%, so I decided to use my degree in electronics (35 years ago) to fix it. The first continuity test I did was between the neutral supply on the back of the mains input socket and the neutral post of the heating element (the one nearest the socket) with a blue wire. The live supply goes via the PCB whereas the neutral goes via a boss that is spring-biased against the base of the removable cooking pot. 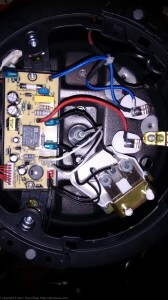 Anyhow, there was no connection to the neutral post of the heating element, so I stripped it down to find that the neutral simply goes via a 190 deg C bi-metallic disc thermostat (thermal switch / cut-out) rated at 16A 250v. I’d say here that the construction of that boss is very crude and everything is held inside by 2 thin metal discs that are pinched in place and are easily wedged out with a screw driver. There’s also a thermistor in there and some thermal paste. I struggled to find an exact replacement thermostat so got a 10A one because they are plentiful and I’d calculated that the max current of a 1000w element at 220v was 4.8 amps. The good news is that it works fine and I’m enjoying using the Instant Pot again, especially after the refund. Thank you so much for sharing this. My instant pot had the exact same issue. The buttons worked but it would not heat. After soldering that pin the pot seems to be good as new. I let IP know what happened hopefully they can fix it this issue in future models. thanks, i fixed mine as well! im very appreciative of your post! I have 6 Quarts Instant Pot in Orlando Fl. It is not catching heat/ not working. can I get it repaired ? Shrikumar Dhami, the instructions in the above blog post are intended to help you repair the item yourself. If you don’t have soldering capability and equipment yourself to do such a repair, I suggest checking among your friends. Many people have such capabilities. Thanks for the write-up. My Instant Pot stopped working last night and I found this website. Unfortunately the controller board in mine did NOT have the same problem. However, just unplugging and reconnecting all the connectors seems to have fixed it. Thanks for the info. I had the same problem. After reading the post, I fixed it as per the suggestion and it is working now. Thanks again. My instant POT is ONLY 3 MONTHS OLD. C6L error. Faulty pressure sensor. Where and how is this replaced or repaired. I have an instant pot with a damaged power cord. Non detachable. I would like to replace it but do not know how. I believe I can get a new one from IP for $15, but when I look inside, it is attached to two little clips connecting it to the curcuit board that do not remove easily. Can you give any advice? 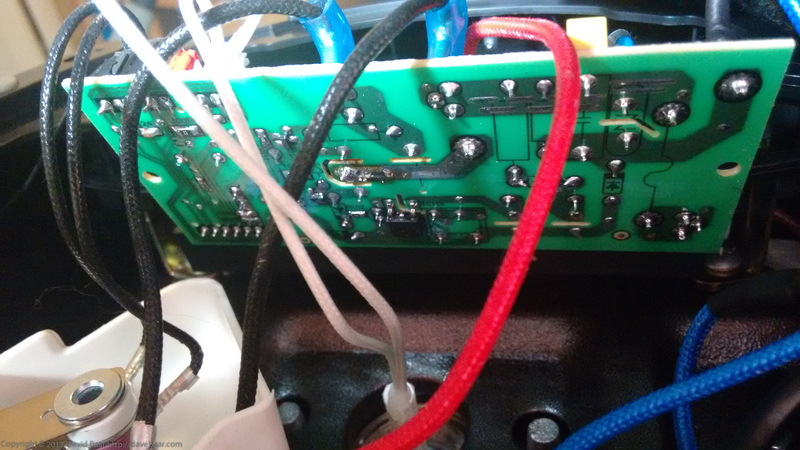 Also,there are failures where the thick and heavy fabric wires attach to the PCB. Wiggle them,as engineers did not allow for more than one PCB repair/replace. You may see the pads on the PCB lifting as I did on mine. Some circuit boards are not the same as pictured here-no matter- examine the board under at least 3x power and bright light. I thank the author immensely for his expertise ! I was going to throw the pot in the dumpster.Didn’t think I’d ever get the parts that may be needed to fix it. PS It should draw about 1000 watts right after you push MANUAL and the beeps end. I use a Kill-A-Watt device to see watts/amps on plug in appliances. I think the author is from GB because of the spelling in the post- and you may have to order a Kill-A-Watt from Amazon. No matter-as long as you DO NOT WRECK the clip on the Printed Circuit Board doing a removal-For then you will need to know how to solder.Use a needle nose pliers on both the connector AND the plug connection,wiggle it off carefully. Maree, if you haven’t add experience working with appliances and power cords, and potentially with soldering, then indeed, you’ll need to be extra careful and might not want to do this repair yourself. I’d suggest asking around among your friends to see if you know anyone who has such experience. That could be a big help. Power cord replacement is a pretty easy task if you have familiarity with appliance repair, but if not, best to ask around, because as Smoke’n sparks notes, the work and result can be dangerous if done wrongly. Thanks so very much Dave. Great instructions, great pictures!!! Worked like a charm and my wife thinks I’m a genius. Mark and Lisa: You’re welcome. I’m especially glad to see that these units are getting fixed rather than discarded. It’s quite surprising to see that so many Instant Pots are turning up with exactly the same problem. I’ve informed the manufacturer once as you can see in the earlier comments, and I might contact them again. Just had the same issue and was able to fix it thanks to this post. So grateful to not have to throw it out and buy a new one. Thanks!!! Thanks a ton for your tip, exact same problem with my Pot and when I reached the support they suggested to replace with new but i was not convinced as the PCB and wiring were all good inside. I had the soldering iron at home, took less than 5 minutes after reading your blog. Thuy and Jithendra Babu Pydimarr, you are both welcome. Via this blog and some neighbours, I’ve been informed of at least 15 Instant Pots that have had this same problem and have been repaired by their owners using the soldering method presented here. I have informed the manufacturer of the problem but I think these failures will be turning up in Instant Pots for a few years to come. Well, at least some of them are getting fixed rather than becoming waste. My insta pot was used twice and when you plug it in and push any button it will not respond. I was using it and it all went black. like it is getting no power. Any suggestions as to the problem ande possible repair. Hi, Myrt. Sure, I’ll offer a few suggestions. Do you have anything that will function as an ohmmeter? (any modern digital multimeter or old analog multimeter will do.) Do you have a soldering iron? First, are there any obvious visible causes? The line cord and plug look to be in good condition, and you’ve plugged the pot into a known good receptacle that other appliances will work from? If nothing obvious, you’ll probably have to open the case up and look inside (unplug it first!). See the pictures in this blog post for help in disassembly. Then, look for wires that might have become disconnected inside. Next, another probable cause, if the line cord is OK, is a blown inline fuse. There’s one such fuse on the main circuit board on the left of the second picture on my blog. Check the resistance of that one. If resistance measurement of that fuse shows an open circuit, you’ll need to replace it with one of similar rating. Also look at the underside of the circuit board for any failed solder traces per the pictures for this post. If the above fails to turn up the problem, check back with me and I’ll see what else I can suggest. Good luck. Thanks for this quick fix Dave, your tutorial and pics couldn’t have been more perfect! Ours is just under 3 years old (Model IP-DUO60, Serial # 150260.1142), and like most others, the relay pin lacked sufficient solder. 15 minutes later and everything was back together and working just like it should. I am, Viswanathan from Chennai, India, senior citizen, 71 years. Electronic Hobbiest and doing some house hold repairs. I was searching in the net for repairing IP and luckily saw your site, that many rectifications are done through your proper guidance and directions. Very glad and appreciate your good work. May god bless you and your family. My daughter in USA gave me an Instant Pot Duo/6 qt. for our Wedding Anniversary gift on March 2018. Here, in India 220 volts. I bought stepdown transformer 220 to 110 volts/1500 watts / 1.5 KV .The Instant Pot is partially working. ie. in rice rice mode (auto) 12 mts. 75% rice is cooked and the balance is not cooked. I have tried in some other modes also. Cooking is 50% cooked and balance is not cooked.. In Saute mode, after pouring oil and mustard, the mustard is not fully fried. The display also goes ‘HOT and On’ frequently. Finally, it goes to off position. Heat is also 40% developed. I think the same problem also continues to all cooking modes. Sufficient power and pressure are not developed for cooking. Therefore, I request your guidance to rectify the defect. Viswanathan, you should first check that the output voltage of your stepdown transformer is really within the specified operating voltage range of the IP, under operating load. In addition, it would be very helpful if you can find a known good IP of the same model to test against. If a second IP gives the same results to yours operating from the stepdown, then you might not have a suitable stepdown transformer, or there could be something else wrong with the transformer. In short, your likeliest path to resolution is to find a known working IP to test against. Beyond that, I suggest that you do some voltage measurements under load. Thanks for your informative mail. Before checking load voltages, I have resoldered all the points which are visible in the circuit board especially in the relay contacts. And then, as you told, I have checked with load voltage when on Satue mode. In fuse: 110 volt (both ends)maintaining. In 1 k resistor 355 volts. No drops in voltage when connected to load. The step down transformer is OK. And I have tried in all the modes also. Now it is working fine. Thanks for your remedial guidance to rectify the defect. I have a Instant pot ip-lux60. It dose not have the same layout inside as per your picture. Also the circuit board dose not look the same. It has stopped heating like the instant pot comment made by Arthur Jackson, but all the lights come on. Can you help at all point me in the right direction? Another question, regarding the sprung Electric Pressure Cooker thermostat temperature switch which has two wire and an earth cable coming out the bottom of it, the stainless steel pan sits on. Should this have an open or closed continuity. Hi, Ben. I don’t know the exact model that you have, but often manufacturers will use pretty similar circuit designs for different models, even if the layout of the parts ends up being a bit different. So, in this case, I’d still look for a bad solder joint at a similar high current relay to what I describe, and also generally I’d inspect the whole circuit board for solder failure issues, since we know that is one common problem for this manufacturer. Another quick check you should do is to check that the heater itself has continuity with an ohmmeter; take it out of circuit (disconnect one terminal) before you measure that. Re your question about the thermostat switch, while I don’t know that model, if it does have a ground connection near it, likely it is a high temperature cutoff (overheat protection) switch and will be normally closed at room temperature but will open if the unit reaches the setpoint temperature of the overheat switch. Also, note that the earth (ground) connection will not normally be switched, for safety reasons; while the grounding connection might go through the switch connector, it very likely isn’t in series with the switch. Just purchased an instant pot duo 8qt and took it all the way to Egypt. I have a voltage converter, however I am receiving the c6 l error. Please help. This pot means the world to me. I am wondering if anyone can help me and tell me the capacitor rating of C101 which is next to the fuse. In addition, the fuse rating. I have instant pot LUX60 model. I have manage to blow the fuse and capacitor. Now, I cannot see the ratings. Hi, Bernie. I think ZNR101 is actually a transient/surge absorber for protecting semiconductor components. I don’t know the value of it but you could probably pick a suitable one from this datasheet from Panasonic or a similar source: https://industrial.panasonic.com/cdbs/www-data/pdf/AWA0000/AWA0000C18.pdf Hope that helps. Daughter accidentally put the wrong pot in my InstaPot. Amazingly, it actually worked for a bit but then stopped. It will not turn on, no lights, nothing. Any idea what I can do to fix it? I have checked the back side of the circuit board and all is good there. Is there a chance it is the fuse? Yes. That is one possible cause of your problem. 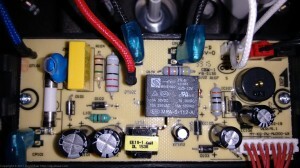 There is a fuse as you can see on the left side of the in-situ circuit board picture. Unplug the pot, and test the resistance of the fuse with an ohmmeter, or just replace it with a known good one. Hi Dave, thank you for posting this. My DUO60 had a electrical over-heating smell to it the other day, then shut off. It now will not turn on at all. I’ve inspected the control board and the fuse, everything looks fine. So I began tracing it back from the beginning. The hot wire is getting power at the plug. The hot wire goes from the back of the input receptacle, down into the side of the pot, underneath the power receptacle. It makes a sharp 180* bend back onto itself at which point its wrapped in a white fabric and its ziptied onto itself. It then loops back to a “lug”(perhaps one end of the heating element?) where it joins the the dark-blue wire and goes on to power the circuit board. At this lug junction of pink and dark blue wire is where it no longer has any power. Any idea if there is a fuse underneath this white fabric wrapping? Or why I might be losing power there? Ok, decided to get brave and dismantle it a little further. It is a fuse wrapped in there. I’m guessing its a thermal fuse the way it was bracketed against the interior wall of the housing. It is blown. I can replace, but I am concerned as to why it may have overheated in the first place. Any ideas as to that? I guess I will replace and see if there is an underlying cause or if it was (hopefully) just a fluke. Jon, can you see a part number or any other identifying markings on that “fuse”? It might be a solid state “thermal cutoff fuse”, based on your description of how it was situated. I’ve seen one of those fail recently, cause not certain but the unit worked after replacing it. This is what one such thermal fuse looks like: https://www.newark.com/thermodisc/g4a01216c/fuse-thermal-216-c-10a-250v/dp/67C6647. If you can get a part number off it, you’ll probably find that they are cheaply replaceable; I think I got 5 of them for about a dollar. Yes I was able to pull the part number off the fuse and ordered a 5 pack off amazon for about 5 dollars. It was a SEFUSE SF139E that’s in a DUO6 model. It had a 142*C blow point so a little cooler than the ones you linked. Not sure what would have caused it to blow, at the time my wife had a large batch of rice, so I think the element had probably been on for a while trying to heat up all that water, I really doubt the pot itself overheated (since it was filled to max with water), so I’m wondering if maybe the constant current combined with possibly a weak fuse was my issue. I replaced it over the weekend and the pot now turns on and functions, haven’t had a need to use it yet though so we’ll see if it holds up in the future. I have a LUX60 and the power cord frayed at the base and the exposed wires broke. I ordered a replacement on Amazon, but it appears to have a ground wire with a loop terminal on one end, but my previous cord had two female quick connectors attached to the circuit board. Is it safe to just solder the loop connector onto the previous connection point? I want to convert my instant pot to run on batteries inside a car. I plan to connect 3 36v batteries for 108v DC. I’ll upgrade the relay to handle the voltage and current. Do you know what voltage is the controller running at? That way I can convert the voltage down to run the controller. The 108v DC will be wired to heater through the upgraded relay.